Dr. Francis A Dambrosio Jr, MD is a Doctor primarily located in Lancaster, MA, with other offices in Gardner, MA and Acton, MA (and 1 other location). He has 39 years of experience. His specialties include Ophthalmology. He speaks English. Dr. Dambrosio has received 1 award. The overall average patient rating of Dr. Francis A Dambrosio Jr is Great. Dr. Francis A Dambrosio Jr has been rated by 19 patients. From those 19 patients 10 of those left a comment along with their rating. The overall rating for Dr. Francis A Dambrosio Jr is 3.6 of 5.0 stars. Francis A. D'Ambrosio Jr., M.D. is a Boston Ophthalmologist and is the Founder of D'Ambrosio Eye Care with offices located in Acton, Gardner & Lancaster Massachusetts. He provides all types of Eye Surgery including Cataract Surgery and Laser Eye Surgery in Massachusetts such as LASIK. Dr. D'Ambrosio Jr. received his undergraduate education at Boston College and his Medical Degree at the Tufts University School of Medicine in Boston, Massachusetts. He completed his Residency in Ophthalmology at SUNY-Buffalo. Dr. D'Ambrosio Jr. then returned to the greater Boston, Massachusetts area and begin serving the medical and surgical eyecare needs of Boston and Central Massachusetts residents. Dr. D'Ambrosio Jr. has been providing medical eye care and eye surgery in the Greater Boston and Central Massachusetts area for over 20 years. Dr. D'Ambrosio Jr. has been providing Laser Eye Surgery in Boston with the Excimer Laser for Laser Vision Correction since its approval since 1995 and has been performing LASIK Surgery in Boston since its FDA approval. He has performed more than 7,000 Laser Eye Surgery procedures in Massachusetts at the offices of D'Ambrosio Eye Care. In addition to being an experienced LASIK Surgeon, Dr. D'Ambrosio Jr. is also a well known Cataract and Lens Implant (IOL) Surgeon. He provides advanced technology Cataract Surgery and Lens Implant Surgery using near vision presbyopia correcting multifocal lens implants such as AcrySof® ReSTOR® Lens Implants, Technis® Multifocal Lens Implants, ReZoom™ Lens Implants and Crystalens® Lens Implants. Dr. D'Ambrosio Jr. is recognized throughout the United States and internationally for his commitment to teaching eye surgeons about innovations in Cataract Surgery and Lens Implants. He has been an invited lecturer about topics regarding Cataracts in Colombia, India, Italy and Spain as well as at professional meetings throughout the United States. 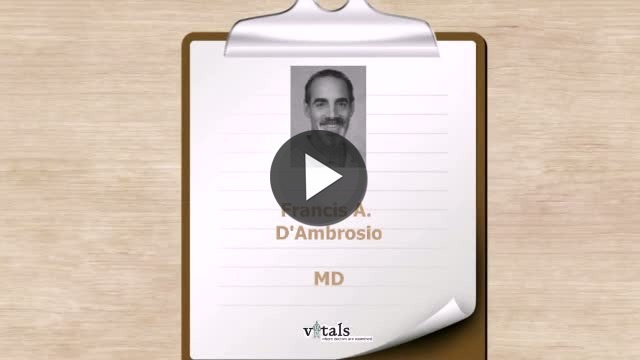 Take a minute to learn about Dr. Francis A Dambrosio Jr, MD - Ophthalmology in Lancaster, MA, in this video.